Where we share, answer, and showcase our knowledge. SimplyClouds provides you an easy, cost-effective way to explore the world of cloud computing at your own pace. You have a wide variety of options with SimplyClouds; you can try our Hosted Desktop, use a variety of Hosted Apps such as from Microsoft Office 365 to access your files and email from anywhere on most any device, or use our Hybrid Cloud feature to access your on-premise applications from the cloud, and with our Hosted Security we keep everything safe. Every tool you use everyday, accessible where and when you need it. We work with you to migrate your business applications and desktops to the cloud and provision them to you and your workforce. Your information is protected by our security, including enterprise-grade firewalls and our intrusion detection systems, with 24/7 monitoring, guarded access, and surveillance. 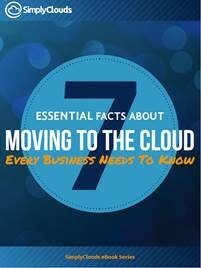 What are the key advantages of SimplyClouds? Cloud services are a great option for businesses that need to optimize IT performance without the huge costs and resources associated with purchasing and managing a fully dedicated, on-premise infrastructure. You only pay for the services and resources you use, with the added benefit of unlimited flexibility. You can add resources as needed and scale use up or down depending on demand. SimplyClouds makes moving to the cloud as easy as ordering everyday items online. No technical knowledge is needed, only the desire to learn how cloud services can improve your work life and productivity. SimplyClouds will do the rest. SimplyClouds provides you with an easy-to-use and friendly interface so you can order, manage, and provision services as necessary, without the need for an IT professional. Software upgrades are available virtually immediately at low or no cost and are implemented automatically. A SimplyClouds Hosted Desktop is just like your traditional desktop, right down to your wallpaper and shortcuts, but it is accessed over the internet. Once you have a hosted desktop, it will be accessible on virtually any device—including tablets, smartphones, and other personal devices, in addition to your office desktop system—and so will its associated data. Your programs, applications, and data will be available to you and your team anywhere and anytime, increasing your productivity and ability to communicate. Unlike other hosted desktops, a SimplyClouds Hosted Desktop gives you a single, highly secure access point for all your applications and files, wherever they reside. Our exclusive hybrid cloud technology provides seamless access to your mission-critical systems and data residing on the SimplyClouds cloud, your on-premise servers, or third party public clouds like those from Amazon, Microsoft, and Google.